This page features a collection of subjects and settings from all over America and beyond that have touched my heart and inspired me over my many years as an "AMERICANA" fine artist. THE COAST OF CORNWALL, ENGLAND ~ The photo here pictures the seaside habor village of St. Ives, Cornwall in England ~ softly glowing in the morning light. How beautiful is this? Made famous by British author Rosamunde Picher's books "The Shell Seekers," "The Day of the Storm" and "Coming Home," I visited the artists' colony in 2002 when in U.K. with my husband on his 50th birthday golfing trip with his best pals. While Doug was golfing with his buddies at Turnberry Golf Club in Scotland, I headed south and spent several days touring Saint Ives' art galleries, relaxing on the beache and exploring the village Pilcher called "Porthkerris" in her novels and short stories. It was Spring, the sun was shining, and the kids were still in school, so I was able to do all the exploring I wanted to with no waiting in line. I painted a portrait of the charming Belyar's Croft Inn overlooking the harbor where I stayed during my visit. Charming as could be, the three-story inn was surrounded by lush flower gardens. 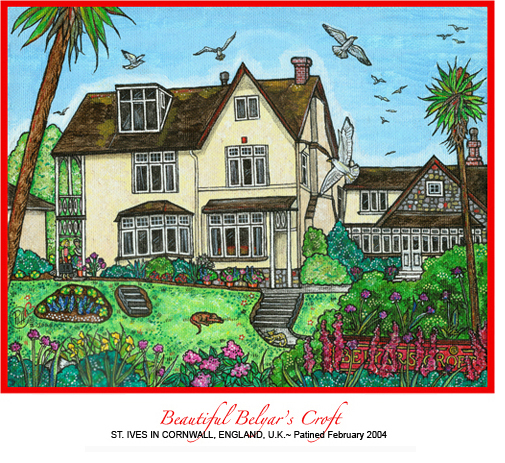 Once home to a sea captain, you'll find my artwork of Belyar's Croft in the "Other Settings (United Kingdom)" section further down on this page. FIVE GROUPS IN THE "MORE COLLECTION"
I've divided this collection into five groups with sub-categories. Each highlights paintings which often revolve with the seasons. Commission pieces with other works inspired by travels here and abroad ~ including scenes of the U.K. and former U.S.S.R.
NEW ARTWORK, GROUP PDFS &"THE BIG LIST"
ENTIRE GROUP PDFS ~ Pdfs at the beginning of each section share ALL the images in that group. "NEW" (text & red bullets) highlights 3 pieces of fine artwork currently being created for 2019's collection and ALL NEW paintings finished in 2018. STORIES & PHOTOS ~ Beneath each group, you'll find a story (often historical), photo, title, location, date of completion and web site (when available). "THE BIG LIST" ~ At the foot of this page you can link to a complete alphabetical list of ALL the titles with descriptions within the More Collection. Red bold type links you to artwork around the site featured in this SPRING 2019 edition. ENJOY ~ and click on Ordering for details on purchasing any of the artwork featured here (now accepting Visa, MasterCard, Discover and American Express). Entire Golf Collection (Some Holiday) pdf ~ Click on this 4-page pdf to see all 17 golf settings. This artwork pictures the vintage cottage-style clubhouse (now demolished) that once served one of Seattle's three municipal golf courses ~ this one located in the Beacon Hill neighborhood just south of the downtown corridor. Two things made the setting special. FIRST ~ Jefferson Park was "home course" to renowned golfer Fred Couples (pictured in the artwork on the putting green) when he was fine tuning the game as a young man. SECOND ~ The course enjoyed colorful gardens and blossom-filled urns leading up to the cottage clubhouse ~ and on the tees and fairways. Spring was particularly lovely at Jefferson Park (PremeirGC.com). Highlight ~ I was introduced to Fred Couples and gave him a print of this artwork at the 2010 Senior PGA event at Sahalee Country Club near Redmond, Washington. He signed the back of the original artwork. 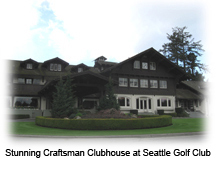 This is a portrait of the handsome old clubhouse designed for the Seattle Golf Club (SeattleGolfClub.com) by the renowned Spokane architect, Kirtland K. Cutter. Built in the early 1900s, this building is adjacent to “The Highlands," a very elite neighborhood that is home to some of Seattle’s wealthiest residents ~ like the Boeing, Stimson and Nordstrom families. There has always been an extremely long waiting list for folks wishing to become members of one of Puget Sounds oldest and most respected private golf clubs. This painting pictured my friend Marie McElhaney’s wedding to Graydon Marting (her parents were country club members there) on a spectacular sunny day. I included some of her wedding party, new husband and new stepson and delighted girlfriends on hand to celebrate. 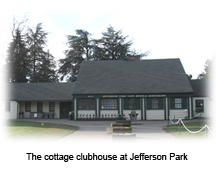 Highlight ~ This handsome vintage clubhouse has been maintained beautifully for over 100 years. Located just east of Lake Washington in the small upscale community of Medina, world-class private Overlake Gold & Country Club (Overlake.Club) was breathtakingly beautiful in the spring of 2001 when I painted this portrait of the clubhouse and pro shop. Gardeners had planted the beds at the tee boxes on the entire course with thousands of bulbs ~ tulips, daffodils, crocuses and more. In full bloom, these were quite an inspiration for its members and guests who came to enjoy the golf course at that time of year. This elite club on King County’s Eastside had several famous members on its roster ~ including Microsoft’s Bill Gates and Steve Balmer as well as several well known sports figures. Highlight ~ My husband Doug holds the distinction of winning the Men’s Club Championship 11 times ~ a record that to this day has never broken. This was a portrait I painted picturing actor Richard Karn making his putt on the 18th green of the Golf Club at Echo Falls (EchoFallsGolf.com) in Monroe just north of Bellevue, WA. Richard made his mark on ABC’s vintage extremely entertaining Home Improvement television show as the bearded plaid-shirted sidekick to comedian Tim Allen. Cheered on by celebrities, volunteers and friends, Richard made it look easy as he raised thousands of dollars for Bellevue’s Overlake Hospital and Seattle’s Fred Hutchinson Cancer Center (now part of Cancer Care Alliance). Pictured (L to R) are Don McKenzie, Cathy Davis, Paul O’Rourke and Paul Lester, host Richard Karn, winners Seattle Supersonics basketball legends Detlef Schrempf and Dale Ellis, volunteers Marcy, Vicki and Jamie, player David Samp, and volunteers Scott and Nicole. I’m part of the group at the right side of this impossible green ~ it’s surrounded on ALL sides by water with only a narrow foot-path for access! Highlight ~ Doug and I were married at the beautiful Echo Falls clubhouse on April 15, 2000. Tthis place holds very fond memories for the two of us we're about to celebrate 19th years together. See our marriage portrait on my Bridal page. Entire Santas /Snowmen Golf Collection pdf ~ Click on this 3-page pdf to see all 15 paintings. NOTE ~ Actual settings like Saint Andrews, Carnoustie and several courses in the United States are part of the "Golf Courses & Clubhouses (Actual Settings)" collection above. Kris Kringle has delivered zillions of packages and enjoyed his “long winter’s nap.” It’s Boxing Day, December 26th, and he has just finished a relaxing round of 18 holes with some of his golf loving elves. There is a celebratory late Holiday Season Open House at the North Pole’s Candy Cane Links Clubhouse and Mr. Claus has hitched a ride on the back of Doug and my zippy little golf cart. When I painted this Christmas-themed piece, I was still in my protective boot from the ankle I broke at my niece Kelly’s September 2018 wedding ~ which is why Doug and I are pictured motoring around in a golf cart ~ something we rarely do! Folks usually find us walking the golf courses. 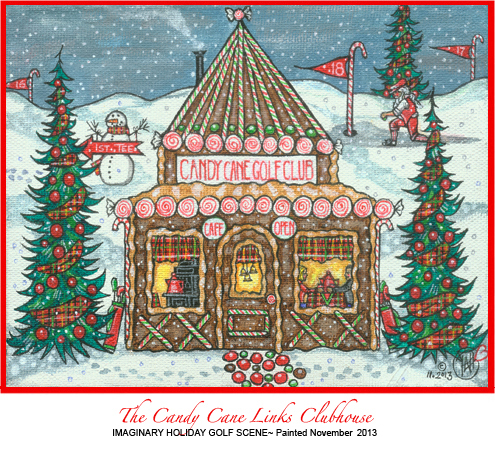 Highlight ~ This artwork marked the 7th painting in the "Candy Cane Links" collection and the 20th holiday golf-themed painting I've created for our Christmas card art ~ my annual gift to Dougie each Christmas! These Candy Cane Links paintings are a grouping within the collection that I add a new piece of art to every now and again. I began creating these paintings cards for my passionalte golfer husband when we first met in 1997 at Christmastime.They are a much deserved not to the sport that he loves so much ~ and happens to have a God-given flair for. 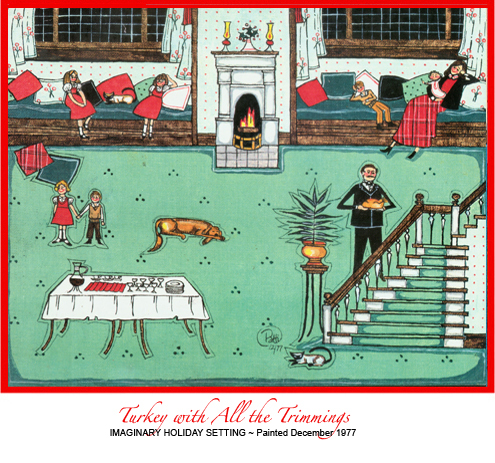 This collection of works featured Santa Claus in knickers (sometimes with Mrs. Claus), elves, snowmen, trains, golf carts and more. They also portrayed a number of actual settings like Saint Andrew's 18th fairway and the Simpson Golf Shop at Carnoustie ~ a "must paint" setting for me with my last name. This painting portrayed a gingerbread candy-trimmed clubhouse with Santa Claus lining up his putt on the 18th hole in the background. A friendly snowman was nearby to point golfers in the right direction to the first tee. I pictured Doug and me in the clubhouse enjoy hot buttered rums ~ the perfect after-golf festive beverage. Hightlight ~ This artwork is the 3rd painting created for my "Candy Cane Links" collection. Even Saint Nicholas deserves to have a little fun after his holiday night-long duties. It’s Christmas Day ~ and geese are roasting in ovens all over the North Pole while Santa’s elves compete for dessert for their holiday dinners. Candy Cane Links is hosting a putting contest over lightening fast groomed ice. The elves are lined up to give each other a run for the money to win the coveted prizes. Third prize is a spicey gingerbread cake and the second, a tangy mincemeat pie. The grand price is a traditional steaming English plum pudding with a sprig of holly in its heart. What could be more traditional!?! Hightlight ~ This is the 5th painting I created to add to the “Candy Cane Links” collection. In this piece Santa Claus was all dressed up in his festively colored “plus-fours” as he was in charge of the Christmas tree detail at the clubhouse for Candy Cane Links ~ his own private golf course at the North Pole. What better way than to tie down the giant evergreen to the top of his candy cane-inspired electric golf cart? Oops . . . that load of holiday lights was about to fall out of the back! This painting was also inspired by my husband Doug’s dear friend Ric Metzger who had the habit of careening around Overlake Golf & Country Club snagging tree limbs that more often than not refused to budge from the roof of his golf cart until he’d finished his 18 holes. Doug had the photo to prove it! See "Santa's Holiday Hazard" above for more on Ric. Highlight ~ This is the 2nd painting in the "Candy Cane Links" collection. Entire Fire Department Collection pdf ~ Click on this 2-page pdf to see all 8 paintings. 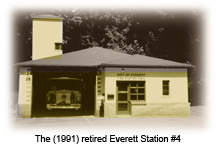 Station #4, Everett Fire Department (EverettFirefighters.org) was constructed of stucco and blond multi-colored brick masonry on 701 Mukilteo Boulevard, Everett, Washington. Opening mid-century in 1948. Arvid Johnson, a retired firefighter who went into political life in his community, was responsible for the construction of the modest little fire station. The first fire engine to be housed there was a late 1940s Kenworth. The structure to the left of the station was built by Firefighter's Local 46 to house on display the vintage Ahren's Fox 1906 pumper, known affectionately among the guys as “The Steamer.” Over the years, the flower gardens the firefighters planted at Station #4 were known for their lush color around the community as evidenced by this portrait. Because the structures were built on a landfill, over the years the floor gradually sank to a total of eight inches by the time that it was retired and closed in 1991. One story has it that originally the tower was constructed to the height of the window, but was found to be too short to accommodate the fire hose, so it was extended further up. Highlight ~ The original painting was completed for retired EMS Chief Michael Lambert who commissioned this piece in 1992 so it could be hung on the wall of a fellow firefighter’s hospital room who was losing his battle with life after a long career. The immaculate vintage Ahrens Fox 1906 pumper (otherwise known simply as “The Steamer”) has always been an Everett Fire Department iconic much loved vehicle. The steamer was delivered to the community’s fire department in December 1907 ~ well over a century ago. I painted this portrait of it in the early 1990s, picturing it parked in front of what once was the very first fire station in Everett, Washington. Sadly, when traffic through town was revised to make way for Interstate 5, this charming stucco one-story building was demolished. Highlight ~ For many years, folks were able to see the old vehicle sparkling like a dime with local firefighters at the reins when Everett celebrated “Salty Seas Days” with a big parade. That annual community event inspired this painting. 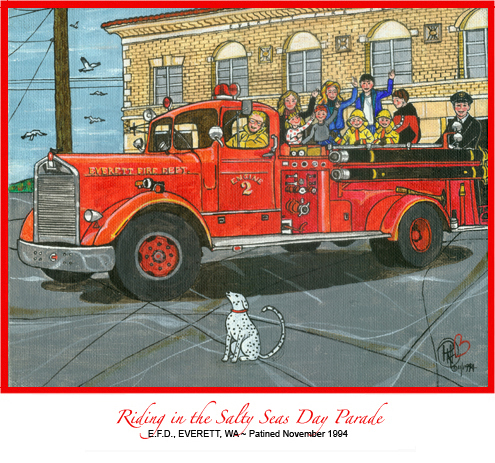 In November 1994, I painted a portrait of the restored vintage Everett Fire Department (EverettFirefighters.org) fire truck Engine #2 ~ one of several that made their way through the parade route crowd along the sidewalks of downtown Everett. Retired firefighter Darrell Jensen drove the fire truck while EMS Chief Jack Robinson stood at the rear. Jack's son and his pal shared the seats with Jack’s wife at the time, Bonnie Richter and me. Another firefighter’s two youngsters were outfitted “for action” ~ dressed head-to-toe in bunker gear. 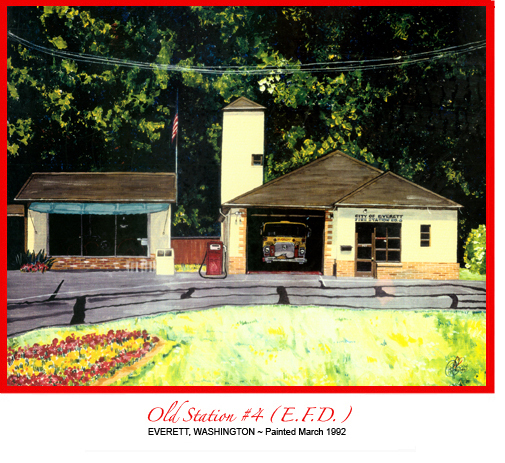 Pictured in the background of this piece was handsome old Station #2 which had functioned for decades as the headquarters for the Everett Fire Department. Highlight ~ In 2010, I donated this original painting to my longtime friend Fire Chief Murray Gordon for display at the E.F.D. vintage Headquarters building. 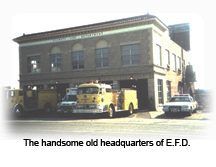 The vintage Everett Fire Department (EverettFirefighters.org) Headquarters located at 2801 Oakes Avenue in downtown Everett, Washington, was occupied for the first time on June 25, 1925. In those days, the entire structure was heated with sawdust. Over the years, a few minor alterations were made to the exterior of the building. The bi-fold doors and small paned windows were replaced with more modern, easy to use door and the intricate art deco sconces flanking the entryway disappeared along with the flagpole on the roof. Other than these changes, the structure has largely retained most of its original character. Old Station #2 is registered as a historical landmark in. Notice the firefighters in vintage uniforms and the steamer and old fire engine in the headquarters’ bays. Highlight ~ The original painting was given to firefighter Michael Lambert (retired EMS Chief) and became part of this private collection. 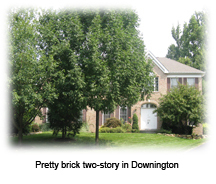 This traditional brick two-story colonial house was the home of the Scott family in the charming community of Downington, PA. Handsomely detailed, the family just loved this handsome two-story brick beauty ~ and thus it became the scene of lots of friendly get-togethers. The four Scotts are pictured on their front lawn enjoying a picnic with all the usual trimmings ~ sandwiches, potato chips, fresh veggies and fruit, lemonade ~ and of course, huge slices of watermelon. Highlight ~ I painted this artwork for Christine Scott, an executive with Microsoft who had been transferred to the East coast. It was the third in a series of three pieces she commissioned as a Christmas gift for her husband to remind them of the wonderful times they shared in the Pacific Northwest. Note ~ Their Orcas Island wedding portrait is featured on my Bridal page. 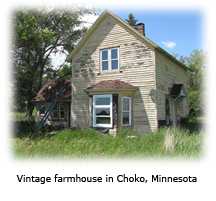 This vintage farmhouse located in Choko, Minnesota, looks much the same as it did when it was built in 1899 by Ole Ulvestad. Notice the black buckboard buggy behind the house in the painting ~ a common mode of transportation at the time, especially in this rural area. Although a bit weather-beaten, the construction of the house must have been very sturdy for it to be standing well over 100 years. Only the windows and perhaps the roof of the structure appear to have been replaced. This piece was commissioned by Patricia Hampton and featured her father’s entire family. Most of his eight sisters wore their “Sunday best” frocks sewn from the same red plaid bolt of fabric by their mother (back upper right) which was I am told was a very common practice in those days. Her dad was the little guy in the front row. An avid genealogist, this painting was inspired by Pat’s journey to the Midwest in the summer of 2009 to see the family’s Minnesota farm. She commissioned this piece as a memento and gave framed prints to her brothers and sisters as gifts at Christmastime that year. In 2003, Doug and I discovered a cozy Mesa, Arizona patio home ~ as it was referred to in the brochure about the complex known as "Mission Square at Alta Mesa." This little Southwest-style stucco "casita" with its traditional red tile roof overlooked the 17th green of Alta Mesa Country Club and brought to fruition my husband's "bucket list" dream of doing a bit of "snow-birding" when he retired. Doug attended college at Arizona State University on a golf scholarship in the early 1970s and loved Arizona's warm dry climate, so spending some days in this part of the United States was very appealing to him. His folks Russ and Kathleen had both passed by 2002, so he used the money from his inheritance to help make this happen. Many hours of fun and relaxation were created here ~ an occasional respite from the gloomy days that the Pacific Northwest serves up after Christmastime. We’re pictured in front of this “desert delight” ~ about to enjoy a barbecue with folks in the area. Highlight ~ For years, gal pals who lived in this friendly little complex rode laps in the evening several times around the interior circular drive on one-speed bicycles ~ each one bike a different color! This beautiful Southwest-style home was once the residence of my dear friend Marie Marx during her marriage to Rick Strohm. During our high school days, Marie, my sister Marilee and I waited until 5:00 p.m. every evening for Marie's mother and Marilee and my dad to finish their work days and collect us after school. Hours of conversation and sharing helped us mark our time together most afternoons at Holy Names Academy. Although our careers and personal lives drew us to opposite ends of the United States, Marie and I always stayed friends, encouraging and supporting each other. One of her dreams when she was married to Rick had been to build this handsome one-story against the backdrop of the McDowell Mountains in Scottsdale. It was a project that she and Rick work on together with their architect ~ and the results were pretty special. In early 2002, I visited her on her milestone 50th birthday and gave her this artwork of her home. When Doug and I relocated from Seattle back to Spokane, Marie soon came back to the Pacific Northwest as well. She continued her very successful career in Spokane, WA as a film producer specializing in videos for non-profits. She was honored in 2017, winning the first place in the L.A. International Video Short category. 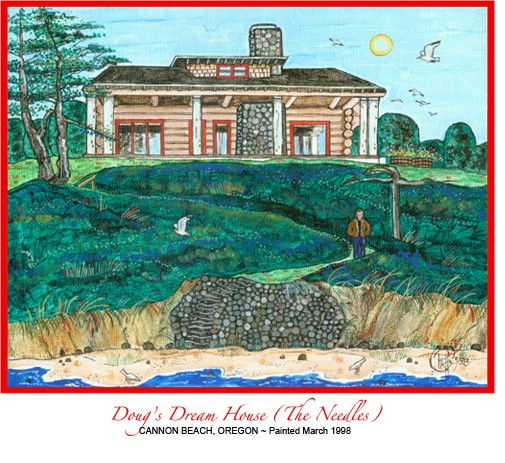 I completed this portrait of Cannon Beach's historic “Needles” log cabin lodge for my husband Doug a couple of years before we were married. The painting commemorated a wonderful Valentine’s Day weekend getaway spent at this beloved seaside community on the Oregon Coast ~ our first vacation together. On a morning beach walk that Sunday, he shared with me that this unique rustic log beauty was his “dream house,” his favorite in Cannon Beach. He even scrambled up the steep bank between the beach and the house to snap some photographs for me ~ which resulted in the surprise birthday artwork gift at the end of March. Highlight ~ we spent several Thanksgivings at this seaside destination after we were married ~ one with his parents and two more with my mother Sally. Truly magical memories! This seaside portrait of Cannon Beach was a special birthday gift I painted for my sweetheart Doug Ward in 1999 when we were dating our way to becoming a serious couple. 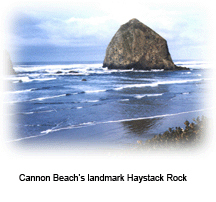 A few months before in November 1998, we had vacationed with his family over the long Thanksgiving weekend at Cannon Beach, Oregon. 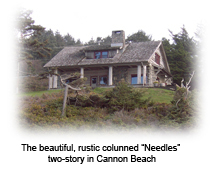 The incredibly picturesque artists’ colony and beloved getaway was a favorite of many ~ and Doug’s family had enjoyed the autumn tradition of spending the holiday at this breathtaking destination for several years. Among the vacationers pictured in this ocean-side scene on the shore were his son Kevin and girlfriend Heather seated on the log to the right. Doug’s older brother Tom and their parents Kay and Russ stood behind them. I painted Doug and me into the lower left foreground gathering driftwood for a beach fire. It was the sunny Friday after Thanksgiving and revelers were enjoying the pleasant day while a breeze tossed kites in the sky. 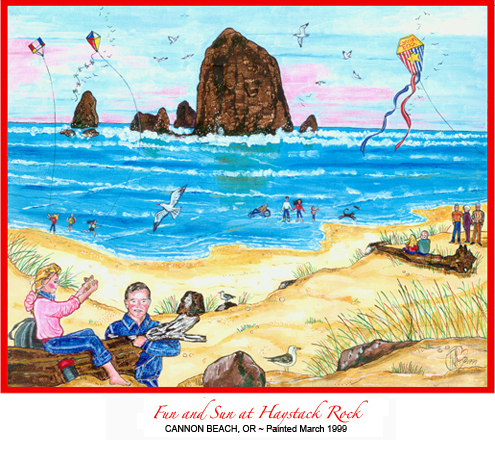 Highlight ~ The artwork would not have been complete without the area's signature Haystack Rock in the background. When I journeyed to England in 2002 with my husband Doug and two of his buddies, Brent Orrico and Ric Metzger, we were there to celebrate my husband’s passion for golf. We wanted to experience the excitement of playing many of the British Open courses. When the boys headed to the west side of Scotland, which included Turnberry and other revered courses, I boarded a train south for England’s Coast of Cornwall, known as the “Cornish Riviera.” My destination was St. Ives, a beloved artists’ colony where during my three-day visit, I stayed at the charming structure pictured here. The friendly innkeepers shared that Belyar's Croft had once been the home of a successful local sea captain. 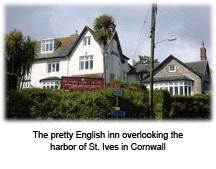 Built in the late 1800s on a hillside overlooking the harbor, it was a five-minute walk from to the heart of St. Ives and afforded a breathtaking view of the Atlantic from nearly every room in the place. 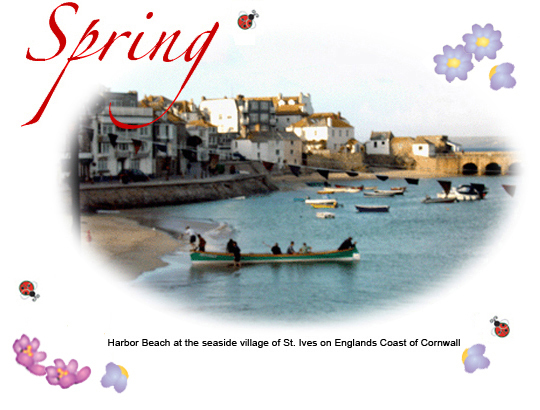 Highlight ~ A trip to Saint Ives had been a dream of mine for year ~ inspired by novels written by renowned English storyteller, Rosamunde Pilcher. In her books, she called this seaside villages "Porthkerris." See the photo of its picturesque harbor at the top of this page. 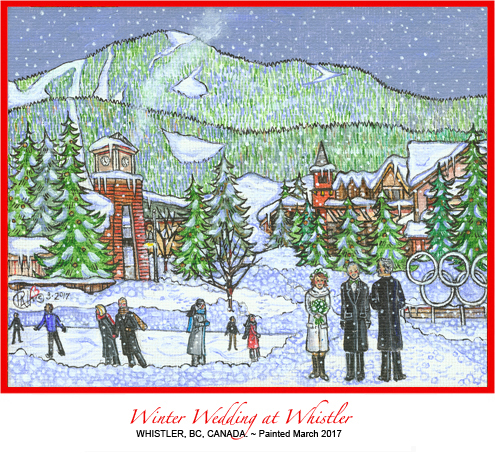 This portrait of beautiful Whistler Village in British Columbia was completed to honor the marriage of some very dear friends of ours, Michele Rostron and Brent Orrico. 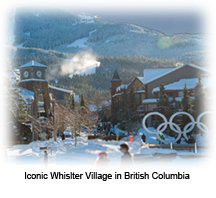 Brent's extended family owned a vacation home in Whistler, British Columbia for many years. Thus, this iconic setting was prettiest place that Doug’s ski-loving pal could have chosen for his small winter wedding ceremony. As pictured here in this painting , the marriage was held outdoors near the skating rink, and yes, Brent asked that I paint Doug and me into the scene among the ice skaters as unfortunately, it was impossible for us to join the couple. The crisp evening was lovely with light snow dusting Whistler Village. I pictured Brent and his fiancé Michele sharing their vows as his brother Dean officiated on Saint Patrick’s Day, 2017. During my two-week journey to three destinations in what was once the former U.S.S.R. in October and November 1988, our group of assorted travelers was incredibly lucky that our trip coincide with the annual celebration of the 1917 October Revolution (the overthrow of the Tsarist royal form of government in Russia). This painting pictured the parade marchers, a handsome float and some of the visiting Americans in our group. The color that day everywhere was "red," the hue most associated with "power." This wascertainly not an accident, although "Peristroika" and the open-minded notion of "coming together" was at its height as Gorbechov was in office. I’m pictured in a red sweater standing next to trip organizer (in sunglasses), Ron King. Highlight ~This original artwork was hung in a gallery in Tashkent, Uzbekistan at the invitation of a museum curator who had befriended us all during our visit to the city. As I mentioned above in 1988, I journeyed to the former U.S.S.R. with a group of about 25 Americans from Seattle on a good will trip. 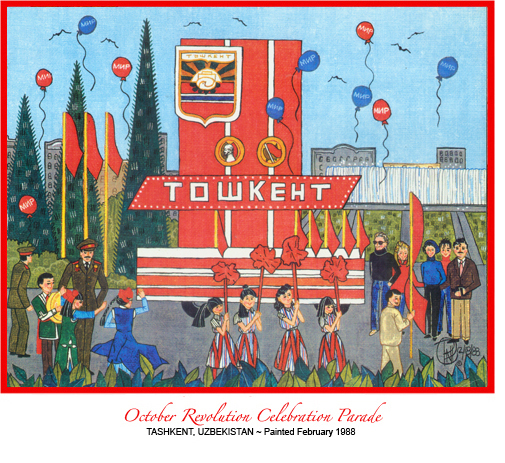 Tashkent had been chosen as a Seattle "Sister City" a number of years before ~ and Mayor Charles Royer's wife had grown up in this part of the Soviet Union. This community was one of three destinations we visited ~ the others being Moscow and Leningrad (now St. Petersberg). In Tashkent, my friends and I made friends with a group of local folks who welcomed us with open arms. We were lucky enough to spend an entire day at one of Tashkent’s day schools for children where we were entertained with dancing, singing and poetry readings in surprisingly fluent English by the youngsters. This amazed us all as our visit had been completely impromptu. I painted the Russian-style classroom where each prominently displayed a portrait of Lenin ~ reminding me of the United States in the 1950s with George Washington's portrait on the wall as well. Unique too was nap time during the school day there. Taking a nap actually meant sleeping in a bed where pillows were decoratively shaped into pyramids. 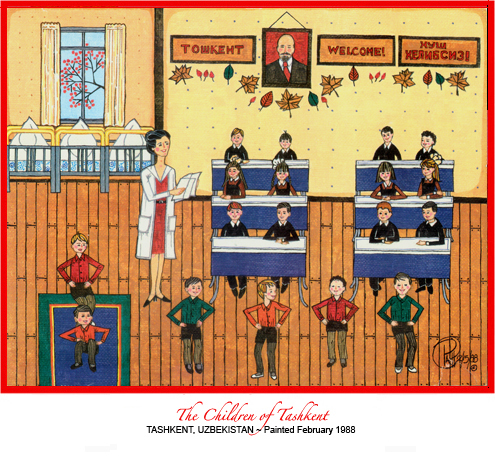 Highlight ~ This painting of the school children was also hung in a gallery in Tashkent, Uzbekistan. Click on my Biography page for more information on this fascinating unique trip. Entire Other Subjects Collection pdf ~ Click on this 3-page pdf to see all 12 paintings. My sister Marilee has always been a dyed-in-the-wool kitty lover. For as long as I can remember, her home has always included a little furry feline or two. 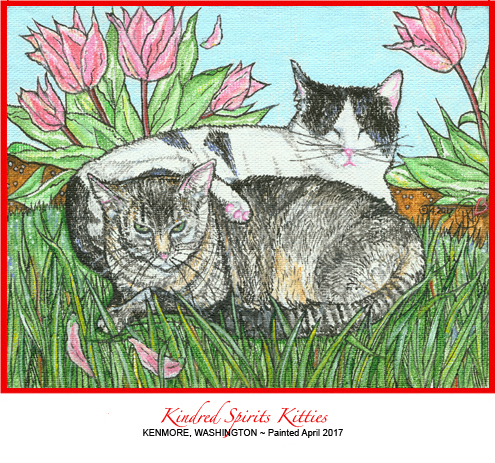 As you can see by the setting noted above, when I created this artwork, the street leading down the gentle slope to her cottage in Kenmore was named “Cat Whisker Lane” ~ perfectly fitting for her two buddies Cookie (the black and white one) and Lady (the tabby) pictured here. Sadly, Marilee lost Cookie a few months before I finished this painting ~ was planned to be a special gift for her "milestone" birthday in April 2017. All the tulips growing that Spring inspired the lush garden background in this piece ~ fitting as my sister has alwasys had a VERY green thumb! IHighlight ~ In December 2018, Lady quietly passed away as well during the Christmas holidays and for a short period of time, their pooch Miko was their only pet ~ but not for long. 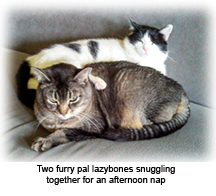 In March, Marilee introduced a new little gray feline with a white breast into the household. Kitties rule! Although a steady stream of pets of all types have “ruled the roost” at sis Peggy and her husband Jeff’s various homes over the years, when I decided to paint portraits of my siblings family pets as Christmas gifts in 2017, those on hand in this family were a little fluffy friendly Shih Tzu named Tabasco (who had survived so long that he had completely lost his sight in both his eyes) ~ and a very large German shepherd named Jada blessed with boundless energy. These two were the exact opposite, but spent several years as roommates nonetheless, ~ looking after each other in their own way. The two have provided the family with companionship and love as well as some very comical moments. Highlight ~ When Tabasco fell off the high bank into the lake below one summer, Jada barked her head off until she got my sister’s attention that the poor little blind pooch was in serious need of rescuing. Kitties galore! My sisters, Marilee, Peggy and I are cat lovers. If you look carefully in this piece, you’ll see my two youngers sisters and me lounging on the window seat in the background of this painting. 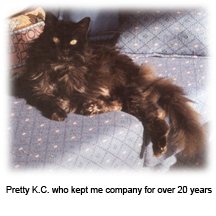 All of our kitties were very independent and each had their own personality. Sadly, our three furry feline friends pictured here have all passed away leaving large holes in our lives. Highlight ~ This painting is a tribute to all the happiness they brought to the three of us Simpson girls. This was a portrait I created of several furry woodland creatures who would rarely be seen in the same setting together ~ especially in such a calm and peaceful atmosphere. And that’s the point! These critters (two squirrels, a seagull, brown bear, giraffe, butterfly, lion, fawn and tiger) have all made friends with one-another and are happily gathered together in this friendly forest scene ~ thus the name of the painting. I created this fun, whimsical piece as a special gift honoring the very first birthday of my Godson, Scot Simpson. His mother Jan had decorated his bedroom with a jungle theme when he was a toddler. Entire Christmas Collection pdf ~ Click on this 1-page pdf to see all 4 paintings. NOTE ~ This collection is in addition to the Golfing Santa/Snowmen artwork featured near the top of this page and other seasonal pieces that are featured on the Spokane and Puget Sound pages during November and December. Years ago in mid-1990s, I was Christmas shopping with my special work buddy Brad Robinson in Seattle. One of the most important items on my list was a Christmas dress. I wanted a real "show-stopper," as more often than not, the company's Holiday Gala was hosted at an equally "show-stopping" event ~ that year, at the iconic Seattle Center Space Needle. We went to numerous stores ~ The Bon Marche (now Macy's), I. Magnim's, Jay Jacobs and finally Nordstrom. At the top of the escalator was this stunning, shiny red plaid taffeta dress with a black velet bodice. Brad say, "Look no further....this is it!" He was right! Now, 20-plus years later, this magical dress still finds its way out of my cedar closet for a handful of special Holiday celebrations ~ and this could be one of those years. I'm hoping to be finally on my feet after the accident that crushed my ankle in early September. My brother Bob and his wife Jan invited Doug and me to join them at the Holiday Gala/Seafood Buffet hosted by the Hayden Lake Country Club on December 22nd. This may be the perfect venue for resurrecting this dress.. Highlight ~ I DO love this it! Other than the piece above, I painted myself wearing it in several other Christmas paintings. 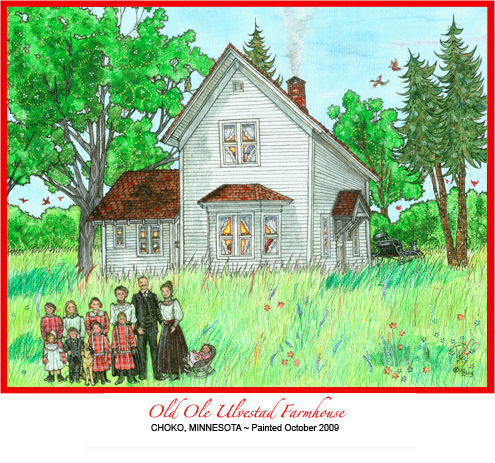 Click on my Browne's Addition Spokane Collection pdf to see "The Christmas House" and "Christmas at the Cambell House" and on my Snohomish for "The Happy Holiday House (Harmon House)." NOTE ~ The works shared below are 3 of 7 VERY early paintings created in 1977 as Christmas gifts for my folks, Sally and Joe, and my youngest brother Bob who was about ~ a mere 40 years ago. 'I’ve painted a dozens of holiday pieces over the years ~ I just LOVE Christmas and my husband Doug has always referred to me the “Christmas Queen.” For the past 40+ years, I’ve created special paintings for my greeting cards ~ that is up until I married Doug in April 2000. 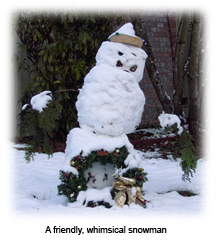 From then on "Holiday Golfing Snowmen and Santa" became the annual theme to honor of his passion for the game). A handfull of these 18 fun works are featured above. This early artwork pictured all six of us Simpsons with Sally mom cradeling her youngest son Bob on her lap. We're all lounging on the comfy window seat, waiting for my dad Joe to unveil his masterpiece ~ "Mr. Gobbler." 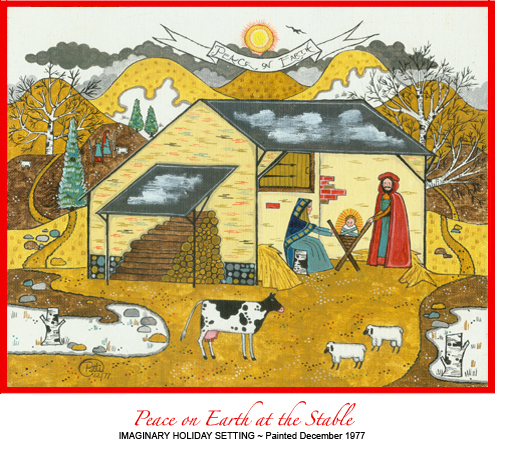 This quiet little stable scene was another of the seven 1977 paintings. My parents were "converts" who became devouted Roman Catholics ~ my dad, when a student at Gonzaga University and my mother, shortly after their marriage at Sacred Heart Church in 1947. When we six Simpson kidsI were youngsters, my parents waged the constant battle to of pushing Santa Claus and his merry toy-making elves into the background of the Holiday. They tried to keep Christ in "Christmas," which was of course was the real reason for celebrating Christmas in the first place. For years, we attended Midnight Mass at Sacred Heart Hospital's chapel. It was a magical place with its sky blue ceiling. The chapel really seemed like "Heaven" with the Sisters of Providence choir singing like angels. In later years, my parents drove our family to the Immaculate Heart Retreat House on the south edge of Spokane's Moran Prairie where the Wessel family also treated the congregation to carols before Midnight Mass. With these fond memories, it was easy to create this little painting honoring the birth of Jesus for my folks. Highlight ~ For decades, they hung this little painting near their tree every Christmas. My mother Sally recently returned the original canvases of "Peace on Earth at the Stable" and "Puffing by the Post Office" back to me to add into my own mix of decorations. As I created paintings for everyone else in the family in 1977, the toughest person to do this for was my youngest brother Bob. Ideas completedly eluded me until my mom finally suggested a Christmas Train. Yes, it was one of those gift that got a lack-luster "Thanks." He was 12 after all! I'm not sure that Bob ever remembered that I painted this piece for him. My mom Sally stored it with her Nativity painting from that Christmas on, I'm sure ~ but finally she gave it back to me a few years ago. Inspired by the humble little locomotive and cars, in 2006, I painted the "Tee-It-Up Train" ~ which was a huge hit with all our pals on our Christmas card list. See it above in the "Holiday Golf Settings" section. Highlight ~ When Bob least expects it ~ perhaps this year ~ I'll frame the little vintage piece and give it to him again! Click on the Red Pointer graphic header here to access "The BIG List" of ALL of the More Collection artwork. Titles are listed in caps alphabetically by group and linked in bold red type to pages throughout this SPRING 2019 edition of the website. QUESTIONS ABOUT THE ARTWORK OR CONTENT? PittyPat Gallery & Studio ~ OPEN Late Spring 2019. Questions? Please phone me. Please Visit my Facebook Page "PattiSimpsonWardArt."